I have always been a fond admirer of Lawrence Keogh. He (like me) went through a kidney transplant not so long ago, and inspires those that have gone through renal failure that you can still lead a full and fulfilling life, achieving the life goals you may have set yourself. Working as head chef of Roast in Borough Market, he has even written a cookbook focused on those suffering from renal failure, focusing on tasty dishes you can eat and make whilst taking into consideration the numerous dietary restrictions that people like me had to endure for so many years. In short, he is definitely someone I respect. Having consumed numerous piggie rolls from the takeaway post stationed in the entrance of Borough market, I had high hopes for Roast. 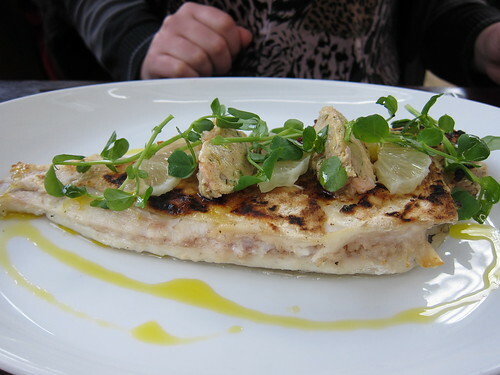 The minute I saw Toptable Spotlight offering £40 for £20, I snapped it up and plotted a trip. I thought I was being clever by scheduling a Saturday lunchtime trip, I could head to Roast and pickup some delights from Borough Market for later consumption. This was my first mistake, Borough was already heaving and the hordes were making me angry as I got there at 12. I was to end up with no treats. The room itself is a nice airy space. High ceilings, lots of natural light with windows absolutely everywhere and a great view of the market below. Scattered with various photographic portraits of people you will recognise, I was left to stare at Simon Pegg's rather sad looking face during the whole meal. With a 2 hour turnaround time, we were keen to order, but after the initial welcome, and the reminder of the 2 hour rule, we struggled to attract the attention of our server, quite a feat in itself as we were sat right next to the till. A little while later, we managed to order, with 3 starters to share and mains. We also ordered the house special cocktail and waited. After a little while, our starters arrived, but there was no sign of our drinks. We ended up asking three times before they eventually surfaced. We couldn't wait around for our drinks so we tucked into our food. It's hard to beat deep fried cheese, but even Laverstoke mozzarella (which is quite delicious) is over priced at £9.50 for 3 measly pieces of lukewarm cheese. Even more parsimonious was the £8 saveloy scotch egg. Basically, it was an overcooked battered egg. The sausage meat was barely there, and no matter how nice the sausage meat around the egg tasted, it was a lot of money to pay for a battered egg. The corned beef and pickled onion hash was better, but did not redeem the two dishes before it. Eventually, as we finished off our first course, our drinks arrived. The mains were at least warm, but were nothing to write home about. The sole (which was a megrim as advertised, and not a lemon sole as our waiter insisted) went down well and was a hefty beast. If there was a gripe, it was not hot enough to melt the shrimp butter on top. 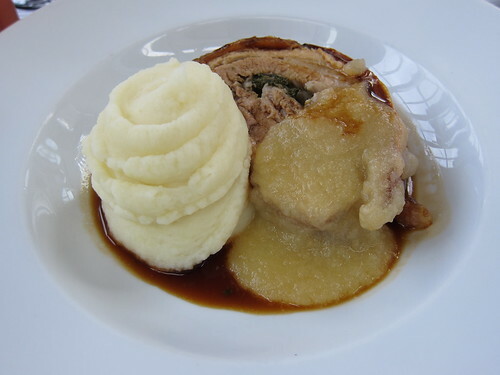 My main of pork belly was decent enough, with excellent crackling, but the meat was on the chewy side, and the apple sauce was poor at best, tasting and looking like apple flavoured baby food. Once again, we were missing items we had ordered. Beef dripping roast potatoes arrived a little while after the mains, and were nothing like the wondrous beef dripping chips at Hawksmoor Seven Dials. Underdone, lacking any crisp, insipid in flavour and actually unpleasant to eat, I had one and couldn't bring myself to eat another. The cabbage we had ordered failed to turn up at all, and when we pointed this out to our waiter, he visibly shrugged his shoulders. A little while later, our cabbage eventually turned up piping hot. The only relief was that we had eventually got some hot food. By the time they had offered us dessert, we really just wanted to leave so we tried to settle the bill, but even that took a few goes to get somebodies/anybodies attention. The total bill pre voucher came to nearly £90, and that was with the cabbage removed and also begrudgingly the drinks. A huge wad of cash for mediocre food and terrible service. We considered desserts briefly, but when I saw them all sitting on the tray by the pass, right next to the heat lamps which failed to keep our food warm., I was very glad I hadn't. I couldn't believe it but I was pleased to be re-entering the seething mass which is Borough Market. I admire you Mr Keogh, but your restaurant, not so much. Heheh... the apple does look like the puree that gets all over me when I tried feeding the Little One these days. Sorry to hear about your experience at Roast. With regards to the lukewarm food, sounds like a case of understaffing. Roast...meh. The only time I really really enjoyed myself is when I just showed up for oysters and champers in the bar. Oh, and live music. That was nice. Such a shame that such an awesome venue has, basically, always been crap. Oh wow, this sounds like a really forgettable experience. 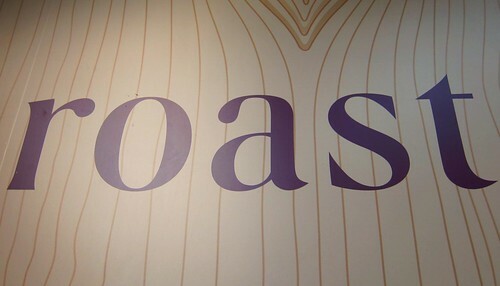 I've eaten at Roast once ages ago and was not impressed - hence haven't been back since. The location is great with the view over Borough Market but that's about it. The food, when I last had a proper meal there, was decent enough, though not amazing. But I shan't be giving Roast another chance after the two recent experiences, one just a week and a half back. @London Chow - I think you may be right as it is a big room. I can't help thinking it was more disorganised and just lacking in the fundamentals of good service. @Krista - Yes indeed. It's been nearly two and a half years now, after having been 6ish years on dialysis. @Tom - Short and sweet. And accurate. @Ute - I love Borough on less busy days, we could have eaten like kings in the market for the money we paid. @Pavel - When it arrived, I thought it was a cruel joke. @Kavey - I just got the feeling that the staff didn't care and would have been happier if we had just left. Lacklustre, and food and drinks not arriving when they should is just inexcusable. 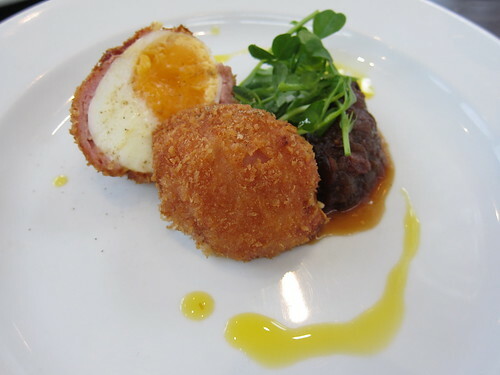 That Scotch egg is an outrage. I agree with the other commenters (and you) re: Roast serving pretty mediocre food at high prices. I think it's just another example of a pretty restaurant in a perfect, tourist-friendly location not bothering with its menu or service. That said, I remember having breakfast there and really enjoying the fresh-squeezed orange juice. That's the nicest thing I can say about Roast, sadly. Thanks for confirming that it's still worth avoiding the place. Thanks for saving me the cash! I went a couple of years ago and the suckling pig left me yearning to go back... Then I heard it's gone downhill. Looks like you just confirmed it! I've heard similarly bad reviews about Roast... people joking that you will spend 5 hours there for a 2 course lunch cos the service is so slow etc. Shame though, the food looks good! Was passable in 2007 but definitely sounds like on the decline. Another sympthom of the Borough Market rental hikes perhaps? Tenant mix is increasingly targetted at silly tourists. They need to improve their menu and service to keep the restaurant patrons. @AiL - It's an extremely popular place for brekkie, but who can mess up a cooked breakfast? @catty - The food really wasn't. And definitely not worth a 5hr 2 course lunch! @GWMG - Roast has become tourist fodder. Sad as a lot of people have said it was good, and it definitely wasn't when I went there. @Supplements - Agreed. The cornerstones of a good resto! I'd like to agree with supplements, but as a person who once went into restaurant service, I know how hard it is to serve several tables with the orders piling up.